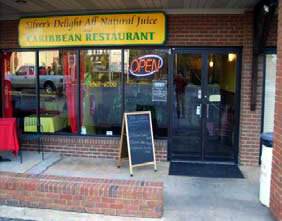 Located on East Point Street in Carriage Station (beside the East Point Post Office and just down the street from East Point City Hall), Silver’s Delight All Natural Juice and Caribbean Restaurant is offering the community a delicious Caribbean cuisine experience including an amazing selection of natural juices. They chose East Point because of the small town feel. The favorable lease agreement they were offered also to helped seal the deal. 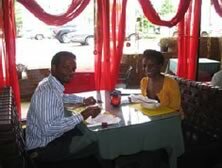 Silver’s Delight All Natural Juice and Caribbean Restaurant is owned and managed by Howard Reid and Cathy Wardford, who first opened their doors in 2003. “We started selling natural juices from a commercial kitchen seven years ago. We are manufacturers of all natural Caribbean juices and juice blends. Our products are available wholesale and are sold in several Caribbean restaurants throughout the Metropolitan area. 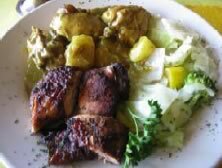 Our restaurant serves a wide variety of authentic Caribbean foods. We will soon offer a unique selection of beers and wines Caribbean style”, says Wardford. “We certainly add cultural diversity to the community. We are available for events and occasionally we have live entertainment. We also participate in the various East Point events” says Wardford. Will Reopen on Sundays in October! Dinner for 3 , any entree (except Snapper) $25.00, dine in only. (Note: This is not buffet style).